The ecosystem of the Grand Canyon, much like the geology, is incredibly comprehensive and samples biomes found throughout the world in its own micro-environment. Within the 1.2 million acres of the park there are 1,500 plant species, 26 fish species, 6 species of amphibians, 35 types of reptiles, 76 mammals, 305 types of birds and a virtually uncountable number of bugs. Elevations vary greatly - the highest being 9,200 feet above sea level and the lowest being 1,200 feet. Just between the rims there is 1,000’ difference, an average 10 degree difference, and a difference of 10 inches in precipitation yearly. This does not even take into account the difference between the rims and the inner canyon, or the dynamics that change the canyon floor due to the steep mile high walls surrounding it. The canyon is a bottom-up ecosystem, meaning the physical aspects structure the biological world. Mainly, the soil composition determines what can grow by its ability to hold moisture. The weather follows a two-season pattern with precipitation being nearly split 50/50 between summer and winter. Summer rains are more abrupt and intense, coming from the south while winter rains are steader and come from the north and west. Life changes in a gradient in the canyon. Biotic communities begin to blend in to one another. Even the timberline varies depending on the slope direction because of the differing amounts of sun different areas receive. 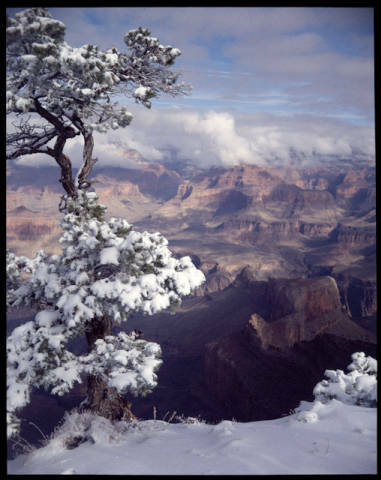 Microclimates exist along the rim because of the meeting of warm rising air with the cooler air of the rim. One can find Boreal forests and mountain meadows on the north rim which are heavily laden with massive trees and receive up to 10’ of snow a year. Just a mile down, there are desert scrub areas with few immediately noticeable signs of life intermingling with the riparian communities of the Colorado river and its tributaries. Ponderosa forests line both rims and pinyon-juniper woodland moves down the slopes. The diversity of the area is astounding. The canyon blends wildlife but also separates it. An obvious example is the difference between the Kaibab and Abert squirrels. The Kaibab squirrel is only found on the north rim of the Grand Canyon, specifically the Kaibab Plateau, and is instantly recognizable by its grey body, tufted ears, and solid white tail. 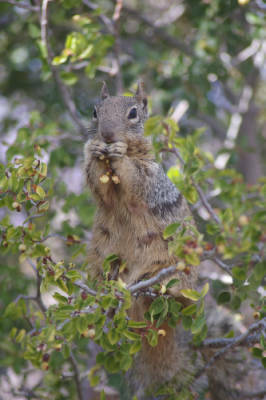 The Abert squirrel, within the park boundaries, can only be found on the south rim. This squirrel has a rust colored stripe on its back, a grey body, and tufted ears. Though both are derived from the same species, one day they could evolve past being able to interbreed because of the canyon divide. Rock squirrels are found throughout the park but have been trained to beg for food… and bite back if refused. Elk are largest animals of the park. Overhunting at one time drove the Merriam elk to extinction in the 1900s. In 1913, Yellowstone and Rocky Mountain elk were crossbred and introduced to the park with 300 being relocated by 1928. 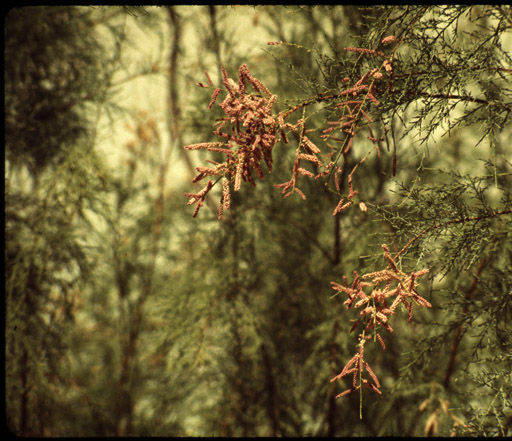 They thrive mainly on the south rim. 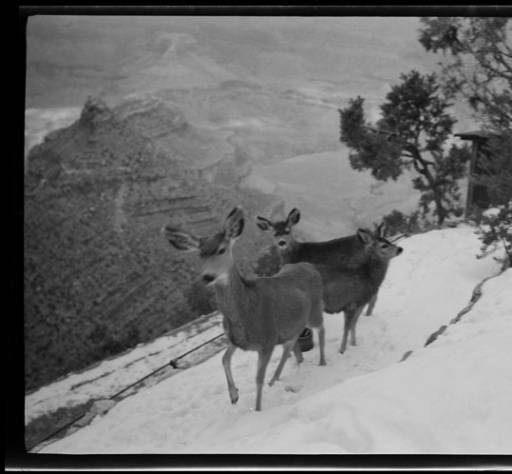 The grass in Grand Canyon village eventually had to be replaced because it was attracting so many elk! Turkey vultures and ravens are also common in the park. Lizards make frequent appearances. Mountain lions are also found. They are solitary and highly territorial hunters, their numbers remaining around 30-120 on the northern side of the canyon.